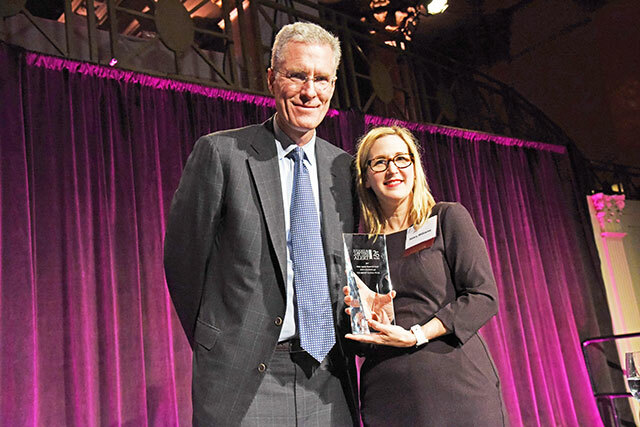 JALBCA held its annual dinner this year at Cipriani Wall Street in Manhattan and enjoyed wonderful attendance of approximately 630 persons, demonstrating its prominence in the New York legal community for education and community outreach. The event was organized by dinner co-chairs Richard A. Edlin and Maura Miller, assisted by an impressive honorary dinner committee and hosted and co-hosted by important law firms and some corporations. Federal District Judge Loretta Preska then introduced Hon. 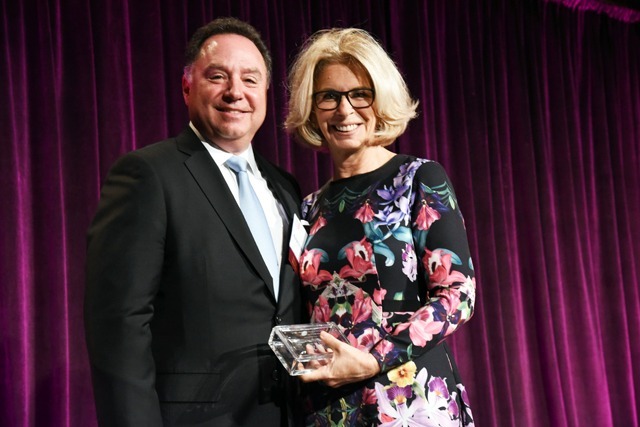 Colleen McMahon who, in turn, presented JALBCA’s Leadership Achievement to New York Court of Appeals Chief Judge Janet DiFiore. 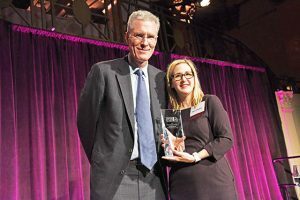 The Maite Aquino Award – the fifth celebration of this award – was presented by Hilary Williams to John Goggins and the Moody’s Legal Team. 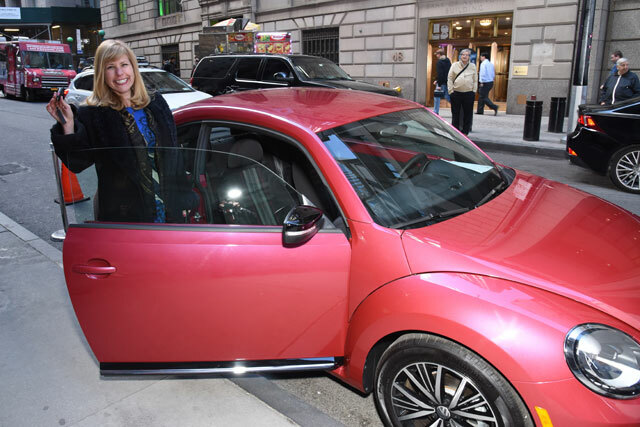 Former Co-President Judith Livingston then presided over the process of obtaining generous sponsors for mobile mammography vans. This Courthouse Alert project, where JALBCA finances the uninsured or under-insured portion of the cost of hundreds of mammograms annually, performed via mobile mammography vans throughout New York City, is a signature project of the organization. In 2016-2017, JALBCA-sponsored scan vans screened approximately 1212 women, of which approximately 138 were recommended for additional medical attention (and three of whom were diagnosed with breast cancer). Approximately half of those screened were uninsured and a quarter were on Medicaid. Funds for at least 41 van days were raised at the annual dinner for the coming year. 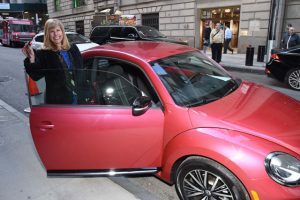 Finally, significant funds were raised through JALBCA’s silent auction, where many members and non-members alike donated a broad array of items, and a raffle for a 2017 Volkswagen #PinkBeetle, the first factory-offered shade of pink in the Beetle’s history, was conducted. On March 22, 2017, the NYU Perlmutter Cancer Center sponsored a program entitled “Protections for Cancer Patients in the Workplace”. Attorneys from the LegalHealth Team of New York Legal Assistance Group (NYLAG) made the presentation. They gave an overview of the interaction between state, federal, and local law that ensures cancer patients’ rights are protected in their workplaces. The Americans with Disabilities Act (ADA), the Family Medical Leave Act (FMLA), and state disability laws were the major laws discussed during the lecture and the material was presented in four broad sections: disclosure laws, securing reasonable accommodations, FMLA, and discrimination in the workplace. The lecturer spoke about the ADA as it relates to at-will employment. This federal law applies to any employer with fifteen or more employees, prohibits discrimination against employees with disabilities or medical issues, and obligates the employer to provide reasonable accommodations for its employees. The ADA has a broad definition of what encompasses a disability and adjusted that definition in 2008 to include immune and digestive conditions. The amendment also ensures that a person in remission is still considered to be under a disability and thus continually protected under the law. The ADA was then compared to state and local laws, which offer more protections to the patient. New York State and New York City disability laws apply to employers with four or more employees, and includes an even broader definition of disability than the federal law (for example, applies even if someone “thinks you have a disability”). As to disclosure, there is understandable hesitation in how much detail about medical conditions and disabilities must be explained to employers. When seeking an accommodation, a patient does not have to disclose much information, only what is necessary for the accommodation. When it comes to pre-employment interview questions, employers may not ask certain questions related to disabilities, but may ask questions if they relate to job function. Employers are free to ask about an applicant’s non-medical qualifications and skills as well as ask applicants to describe or demonstrate how they would perform the job tasks required. During a conditional job offer, an employer may ask disability related questions and require medical exams as long as it is done for all employees. Once a person is employed, there are much more protections and flexibilities when it comes to disclosures. For example, inquiries made on the job should be consistent with the business and job related. Importantly, these restrictions do not apply to drug testing. The ADA and coordinating state and local law provide employees with the right to request and have provided for them reasonable accommodations at their workplaces. Accommodations must be made so long as a worker can perform the essential functions of her/his job. There is no set list of what a reasonable accommodation must look like, and employers can be creative. A few examples include making existing facilities accessible, job restructuring, acquiring modifying equipment, creating modified work schedules, changing tests, policies, or training materials, and reassignments to a vacant position. The disclosure relative to a reasonable accommodation request can be low. A person has to identify s/he has a disability but does not need to be specific about diagnosis, symptoms, or medications. When preparing to request a reasonable accommodation, an employee should ask his/her doctor to prepare a document with the following: identify themselves as the treating physician, identify patient’s medical condition (specifically or generally depending on the preference), describe the patient’s symptoms and impairments as a result of the disease (again depending on preference), describe the reasonable accommodation as medically necessary and, importantly, state that the patient is able to perform the essential job functions required. Thinking practically, it is better for an employee to ask sooner rather than later for a reasonable accommodation. A reasonable accommodation request won’t be granted if it causes undue hardship for the employer. There is no specific way to ask for a reasonable accommodation, and employers cannot access medical records of its employees. Any information the employee provides related to the request including, for example, a letter from his/her physician, should be kept in a separate file from other employee records and only accessible on a need-to- know basis. What is important is that process needs to be interactive between the worker and boss, and not one-sided. The Job Accommodation Network has made available examples of reasonable accommodation requests and various documents at www.jan.wvu.edu. Cancer patients might face discrimination in the workplace and NYLAG gave the audience instructions about what to do if an employee suspects or faces discrimination. They suggested the employee keep records and emails, talk to someone in a higher position at the workplace, speak to an attorney, and file with the Equal Employment Opportunity Commission. Finally, the lecturer spoke about the recent FMLA and how it works, what protections it offers, and how to apply for it. The FMLA applies to all employers with 50 or more employees. Importantly, an employee must be working at the job for at least 12 months before being able to take advantage of the program. FMLA obligates employers to provide unpaid leave with job protection for up to 12 weeks. Health insurance coverage must continue during this time. This is important for cancer patients because it means they can undergo treatment, surgery, or take care of family members without fear of losing their job in the process. The unpaid leave can be intermittent so an employee, for example, can take a four week leave and a six week leave later and two week leave even later. Employers must advise their employees of their rights under the FMLA. There is a lot of overlap with the ADA, especially with the reasonable accommodation portion. FMLA leave can be used multiple times. During a FMLA leave request the employer is allowed to ask for quite a bit of personal information such as proof, biopsy results, and even asking the employee about going to another doctor. The NYLAG attorney explained that, under the FMLA, confidentiality goes out the window, although the supervisor still may not disclose to other employees. Another option, similar to the FMLA medical leave, is short term disability under state law. Only states require employers to offer a minimum of short term protections for this disability leave. This leave is generally up to 26 weeks. A question-and-answer period followed. For additional information and resources, websites such as www.nclsn.org, www.cancersandcarers.org, and www.legalhealth.org were identified. 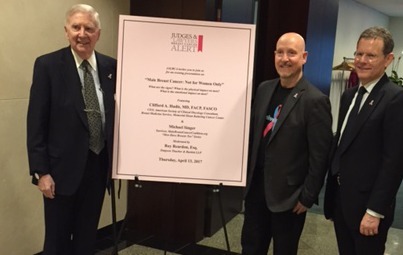 On April 13, Simpson Thacher & Bartlett hosted the program, “Male Breast Cancer: Not for Women Only”, featuring former JALBCA Board member Roy Reardon, Esq. (Partner, Simpson Thacher & Bartlett LLP) and panelists Clifford A. Hudis, MD (MSKCC) and Michael Singer, Survivor (MaleBreastCancerCoalition.org “Men Have Breasts Too” Series). A more detailed discussion of this program will appear in the next JALBCA Newsletter. On March 30, 2017, the NYU Perlmutter Cancer Center sponsored a program to provide medical and scientific updates from the San Antonio, Texas Breast Cancer Symposium in December 2016. Dr. Perez spoke extensively about certain breakthroughs in radiation oncology. The topics covered during her lecture were improving convenience of radiotherapy, research on predicting high risk patients, understanding toxicity from radiation therapy on breast cancer, and presentations of ongoing clinical trials that deal with radiation. Looking at breast radiation, there are varying schedules for dosages and frequency of radiation administration. Dr. Perez spoke about a hypo-fractionated schedule where the doses are higher so patients can finish in a shorter period of time. Also, she spoke about partial breast irradiation (PBI) which involves treating only part of the breast in high doses so the overall time of treatment is shorter. She described a study from Italy which studied whether there was an overall quality of life improvement of patients who received the PBI treatment as opposed to the traditional schedule, radiating the whole breast. That study concluded that the women who received the short PBI felt they had a better quality of life compared to women who had received the traditional protocol. There were multiple categories including symptoms, perception, and thoughts about the future. She also mentioned a Canadian study which involves hypo-fractionating the radiation so it takes only three, instead of six, weeks of treatment. Patients’ arm symptoms were discussed – those who experienced the hypo-fractionated treatments had less problems with their arm function. The study showed that this study could be used beyond breast only radiation. Generally, hypo-fractionation is viewed as being more convenient and less costly for patients. The final study discussed was from Sweden with patients who had low risk characteristics where radiation could be safely omitted. With a relatively short follow-up of five years, the incidence of breast cancer recurring after surgery only were very low. This shows that it is possible to omit radiation and still remain cancer-free. This study was confirmed with a similar study in Japan. Patients who can omit radiation benefit from a decreased likelihood of toxicity-related problems compared to patients following radiation. Dr. Perez also talked about examining the blueprint of cancer cells for a red flag – a defining gene signature – that would indicate the likelihood of tumor recurrence. This would be a defining signature in genes. Michigan researchers worked on this study collaboratively with the Netherlands. For patients who had a gene signature which predicted non-recurrence, their cancer did not recur. Dr. Perez was confident that this test would become available in the clinical setting. She also spoke about various studies involving patients who do not need radiation. The study involves patients involved in surgical removal only. Even in the high risk patients, the recurrence rate was very low. The study was based on patients with tumors five centimeters or smaller. The point of these studies is to reduce toxicity. Other studies involved the complication rates with mastectomies and reconstructions when the patient underwent radiation therapy. Different reconstructions (either implant or based on a patient’s own tissues) showed different rates of complications. Three interesting clinical trials – mentioned as ones where the researchers were thinking outside the box – were as follows: (1) MD Anderson: Is it safe to skip surgery in patients with breast cancer? First patients undergo chemotherapy and then they undergo a biopsy (based on tumor size and very little nodes; two specific types of breast cancer, age 40 or older). If biopsy shows a complete response, the breast is not operated on and the patient only undergoes radiation; (2) OSU: Is it safe to treat patients with radiotherapy before lumpectomy? The rationale is that if you can localize, you can treat a smaller area of breast. Treatment uses the PBI approach, mentioned above; and (3) National: For patients with metastatic disease, is it beneficial to consolidate to those areas of metastases (no more than four in lung, bone, spine or no more than two in other organs)? Dr. Schnabel’s lecture highlighted that the breast cancer conference expanded knowledge regarding patients who have a genetic predisposition to breast cancer. Talks included those by doctors from the Mayo Clinic speaking about studies to help clarify risks associated with predisposition genes, especially new ones, other than BRCA-1 and BRCA-2. The study involved researching risk estimates for patients who carry fewer common genes for breast cancer. The study looked at genetic testing results, testing for 21 known and possible candidate genes that increase rates for breast cancer. Some uncommon genes increased the risk for breast cancer but only in a moderate way. It was important to conduct large studies because it clarified that some uncommon genes did not increase the risk for breast cancer. We need to understand in a precise way how they impact the risk. Some increase the risk while some do not. This might change the recommendations medical staff make to clients, based on genetic testing results. Dr. Schnabel described other talks by the same Mayo Clinic physician which looked more broadly at predisposition genes. We know the most about BRCA-1 and BRCA-2 mutations. Males with BRCA-2 have six times the increase in their risk from breast cancer. Additionally, with new research emerging, scientists can begin to quantify the risk for men with BRCA-1 and BRCA-2 and their likelihood to develop prostate cancer. Dr. Schnabel found it most interesting that BRCA-1 genes show an increase for a specific type of breast cancer called triple negative breast cancer. But Dr. Schnabel urges caution with rare genetic mutation studies because the number of individuals who had these mutations and developed cancer was very small. We need to test more patients before the information becomes even reliable. The research is not based on a large number of patients and therefore one cannot make broad generalizations about the impact on a larger group of patients. Dr. Schnabel also spoke about a United Kingdom study of BRCA mutation carriers under 40. This study looked at particular kinds of breast cancer. Those with the BRCA-1 mutation had a higher rate of developing triple negative breast cancer, while those with the BRCA-2 mutation developed the garden variety cancers that looked more like sporadic cancer as opposed to hereditary cancer. When BRCA carriers and non-BRCA carriers were compared, the outcomes and survival rates were the same. But specifically, triple negative breast cancer showed different survival rates. Dr. Marleen Meyers, Director of Survivorship and Assistant Clinical Professor in Department of Medicine at NYU. Dr. Meyers’ presentation focused on hormone therapy, scalp cooling, and the IBM Watson computer. She first explained some basic cancer terminology including types of cancers, symptoms of particular cancers, and descriptions. A study focused on the question of “how can we stop resistance to hormone therapy?”, looking at early breast cancer settings only (before metastasis), while also noting it is important to look at cost, toxicity, and overall outcome. The study involved giving a certain class of cancer patients (estrogen receptor positive) CDK inhibitors which stimulate the cell to grow. The goal is to arrest cell growth (particularly cancer cells). Also, researchers have to look at costs (not just monetary, but side effects as well) when considering inhibitors. Since the side effects were tolerable, a decision needs to be made as to whether this will be helpful to use earlier rather than later for those who have a recurrence of breast cancer. Finally, she mentioned the IBM Watson computer and an India study which examined whether Watson was better than oncologists. However, since oncologists in India use different standards than in the US, it is difficult to translate the results. However, there was some conformance between Watson’s recommendations and those of the oncologists. Drs. Perez, Schnabel, and Meyers answered audience questions after the conclusion of the program.